Pip pip! Cheerio! Wot's all this then? This is the first part of the first set of a much larger collection. For the last 2 years, I have been working on and off on a very large project called The Manor House Collection. 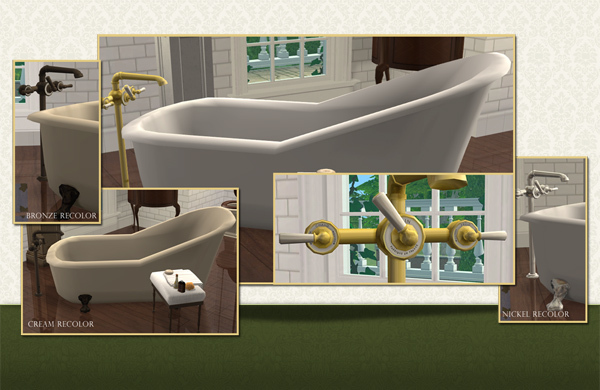 It is a collection of very ornate and classically styled items to decorate your simmy manors. Essentially the Manor House Collection is more or less in the same style as what I usually make, but on crack/steroids/Starbucks/insert vice of choice. 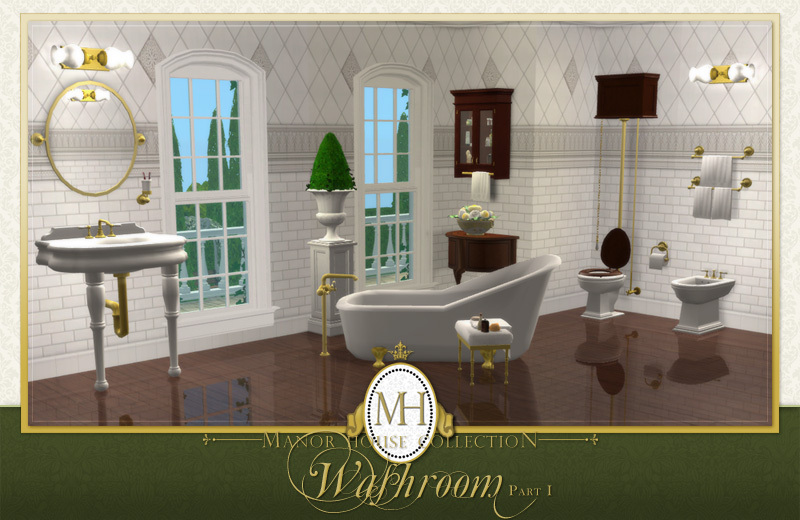 The Manor House Washroom is the first set of this collection to be released, and I've broken the entire Washroom set into two parts. This is the first part. 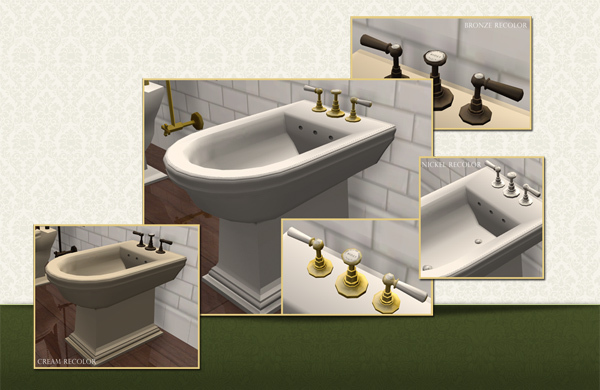 Part one of the Washroom set consists of all the plumbing fixtures: slipper tub, toilet, bidet & sink vanity. Each mesh comes with various recolors you can mix, match and play around with. 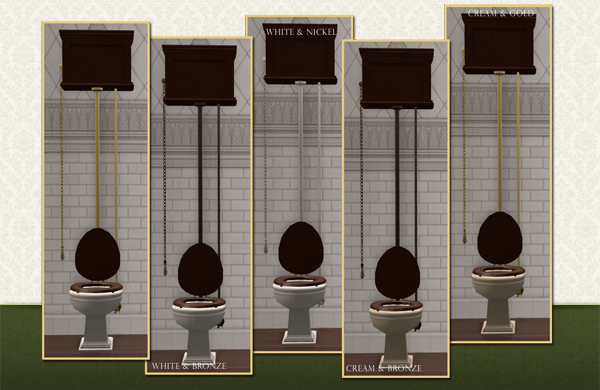 There are also two subway tile walls in grey and brown to match whichever color combinations tickle your fancy. Do I need to say that everything in this set is high-poly? I mean, you can look at and tell right? One day I will upload nothing but uv-mapped cubes made up of only 12 polygons, but today is not that day! It's up to you to decide whether the high-polytude of this set is worth any potential computer slow downs. You may recolor this set, but you canNOT clone it, hack it or alter the package files in any way! You may also include it in houses and lots, but NOT if you are uploading to the exchange or any paysite (exception is TSR). If you recolor this, don't host these mesh files anywhere else. Please link back so that downloaders can get the actual meshes here. Please give full credit and a link back if recoloring or adding to a lot. 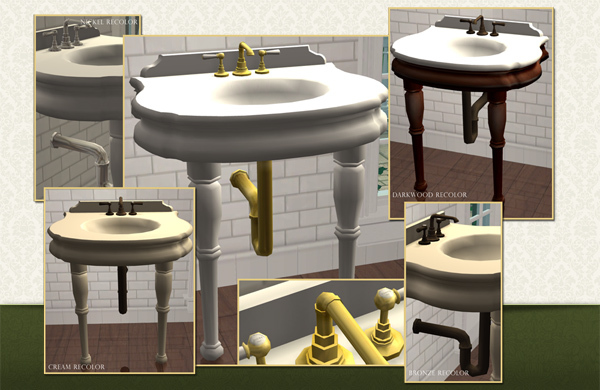 Note: The attached collection file is for the entire Washroom set, meaning that when Part II of the Washroom is uploaded, those meshes will "appear" in the collection file when browsing in-game. SimPE, CEP, Photoshop, 3D Studio Max.